These pieces feature slices of amethyst stalactites that took shape in caves over millions of years. Stalactites begin with a single droplet of mineral-rich water that forms on cave ceilings and then falls to the ground, leaving behind a thin ring of calcite. Each subsequent drop deposits another ring. As millions of years pass, these rings gradually build to create glittering, crystalline columns of natural minerals. 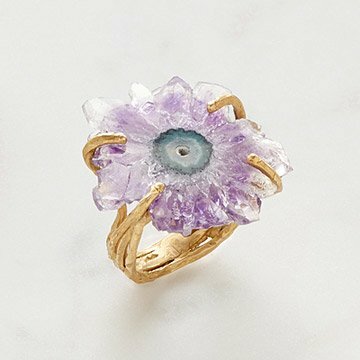 Handcrafted by Emilie Shapiro, these pieces display amethyst stalactite crystal slices that took shape over millions of years deep within caves. She sets each ancient treasure in a bold recycled brass bezel that emphasizes the stone's natural beauty. Handmade in New York City. Make it a set! Pair with the matching necklace and earrings.